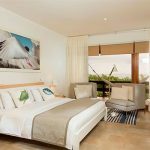 Begin your expedition with a wonderful stay in Quito (the Middle of the World), then enjoy a wonderful stay-put Island Holiday Adventure at the charming beachfront Finch Bay Eco-Resort Hotel in Santa Cruz Island. 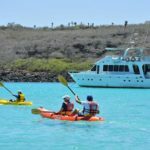 Cruise to different nearby islands for exciting explorations and snorkeling and kayaking opportunities. 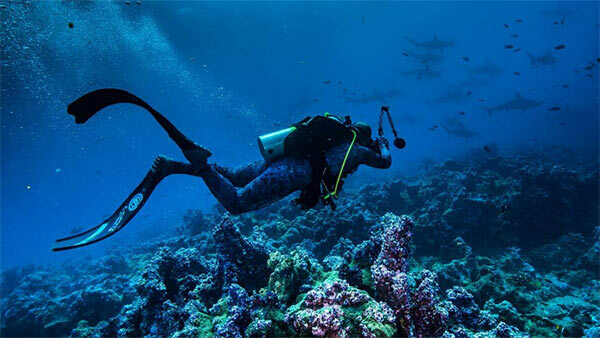 Be a guest at the Charles Darwin Research Station, see the giant tortoise breeding center, the impressive vegetation, land, marine birds, land iguanas, and other species, and admire the Twin Pit Craters with this getaway. 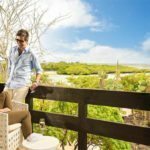 After the day’s activities unwind with a drink at the poolside bar or go for a late swim, or visit the quaint town of Puerto Ayora. Monday: North Seymour | Tuesday: South Plazas | Wednesday: Santa Fe | Thursday: Santa Fe | Friday: South Plazas | Saturday: Bartolome | Sunday: North Seymour. NOTE: Schedule subject to change on-site due to weather conditions and/or Galapagos Park Authority Directive. 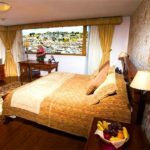 Meet and greet service at the Quito airport and private transfer to the Patio Andaluz Boutique Hotel (or best available) for a three-night stay with breakfast and taxes included. DAY 2 | Guided Excursion of Quito & Middle of the World Monument l B. Visit the old Spanish Colonial District of Quito with its beautiful plazas and unique churches. 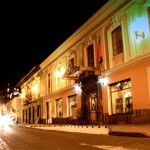 The Spanish architecture converts Quito in a very special place. After the visit of the old town, we will take you to the south side for a magnificent view of the city from El Panecillo lookout point. A visit to the Middle of the World monument is also scheduled. Mitad Del Mundo is one of Quito’s most famous attractions, situated about 10. Km. to the north of Ecuador’s Capital. In 1736 a French scientific expedition came to Ecuador to determine the position of the Equator. On the sight there is a monument, which houses an Ethnographic Museum. Here you will learn about life styles, clothing, and utensils of different ethnic groups of Ecuador. Just outside Mitad Del Mundo there is an interesting open-air museum called “Inti-Ñan,” which explains our solar system, the position of the equator and its effect on gravity; also interesting displays of Ecuadorian ancient cultures and their ways of life. Return to the City by mid-afternoon and drop off at your Hotel. Afternoon at leisure. DAY 3 | Guided Discovery of the Otavalo Andean Region with lunch at a Hacienda l B.L. We begin our travels north of Quito, towards Otavalo, visiting the small village of Calderon, known for its unique and colorful ornamental ‘baked-bread’ dolls (figuras de masapán). We then continue along the Pan-American Highway to Guayllabamba to taste one of Ecuador’s endemic fruits (the chirimoya), stopping en route to admire the region’s beautiful landscape and snow-capped mountains, making a short stop at San Pablo Lake before arriving at Otavalo. Here we visit the busy textile market located at ‘Poncho Plaza’, famous as one of the largest open-air markets in South America. Find all kinds of handcrafts including tapestries made on old-Spanish weaving looms, and even older pre-Columbian back strap looms. Stop for Lunch at a Hacienda. Enjoy some free time to shop (and haggle) with the friendly Otavaleños. In the early afternoon we visit a colonial hacienda for lunch. We then head to the small artisan village of Cotacachi and return to Quito in the late afternoon/early evening. DAY 4 | Mainland Ecuador to the Galapagos Islands’ Finch Bay Resort l B.L.D. Transfer to the Quito airport for a local flight to Baltra Island Airport (airfare is not included). On arrival, meet your local host for a short ferry-boat ride across the Itabaca Channel. At the landing, board one of the hotel’s vehicles for a scenic transfer across Santa Cruz Island to Puerto Ayora where the Finch Bay Hotel is located. Stop en-route at the Santa Cruz Highlands for a visit to a local hacienda for lunch and observation of the Giant Tortoises in their natural habitat. After lunch, continue to the resort. Check-in at the accommodations of your choice: Finch Bay Rooms, or Finch Bay Suites. Enjoy a four-night stay with all meals, taxes, and featured excursions included. Balance of the day is spent enjoying the glorious beach-front location and facilities of the resort. DAYS 5, 6 & 7 l Enjoy Two Full Days Island Yacht Explorations and One Full Day Land Exploration l B.L.D. North Seymour was lifted from the ocean floor by a seismic event, and its origins as a seabed give the island its low, flat profile. Cliffs only a few meters high form the shoreline, where swallow-tailed gulls sit among the ledges and rocks. A tiny forest of silver-grey Palo Santo trees stand just above the landing, usually without leaves, waiting for the rains to burst into bloom. This island is teaming with life! You might have to give way to a passing sea lion or marine iguana; blue-footed booby nests sit beside the trail where mating pairs perform their courtship dance. Further along, the rocky shore is interspersed with white sand, while large flocks of pelicans mass for a dive-bomb feeding-frenzy, painting a tableau from ages long past for us. The trail turns inland to reveal the largest nesting site in the Galapagos of the magnificent frigate bird. These huge, dark acrobats have two-meter (6-foot) wingspans, and males, with puffed up scarlet throat sacks; sit precariously perched in low bushes to watch over their equally large chicks. This is a walking excursion and involves uneven rocky terrain. Dry landing. Santa Fe offers one of the more beautiful and sheltered coves in the archipelago. Its turquoise lagoon is protected by a peninsula of tiny islets forming an ideal anchorage. The island lies to the southeast of Santa Cruz within sight of Puerto Ayora. Like North Seymour, Santa Fe has been uplifted, and you can see where underwater lava once cooled off (pillow lava). A wet landing on a sandy white beach brings us into contact with one of the many sea lion harems. Bulls vie for the right to be Beach Master, while smaller males masquerade as females and make stealthy mating moves. Galapagos hawks are often easily approached, perched atop salt bushes. The giant prickly pear cactus found here live up to their name, with tree-sized trunks! Our goal is to spot one of the large species of land iguana, native to Santa Fe. Beige to chocolate brown in color with dragon-like spines, these huge iguanas truly resemble dinosaurs. An indigenous species of rice rat also inhabits the thickets, and lucky hikers can spot harmless Galapagos snakes. After the hike, there is nothing more inviting than a swim in the calm waters of the bay, a great snorkeling opportunity with diverse marine life. This is a walking excursion and involves uneven rocky terrain. South Plaza is a small island full of fascinating wildlife, both along its shore and along its dramatic, wind-swept cliffs: sea lions, land iguanas, swallow-tailed gulls, Opuntia cacti and vegetation that changes colours according to the season. The island is one of a pair of crescent-shaped islands. While the northern twin remains accessible only for scientists, South Plaza is one of the Galapagos’ most impressive visiting sites. Only 130 meters wide (426 feet), the island was formed from uplifted seabed, giving it a tilted table top aspect. Our landing is in the channel between North and South Plaza, where the island slopes down toward the water. The approach makes for a lavishly colourful sight! The turquoise waters of the channel contrast brilliantly with the white sand and black lava of the shoreline. The rocks have grown thick with green seaweed in places, speckled with bright orange Sally light foot crabs. Further up the shore, a carpet of scarlet Sesuvium succulents serves as groundcover for a grove of luminescent green prickly-pear cactus. Yellow-grey land iguanas sit beneath these, waiting patiently for pears to drop. The trail gradually follows the tilt of the island to the cliffs that overlook the ocean to the south, where swallow-tailed gulls nest. Red-billed tropic birds, Nazca and blue-footed boobies ride the gusty currents. The overlook is a great place for spotting large marine life, including manta rays. Surf pounds an inlet at the western corner of the island, where a colony of bachelor sea lions make their home, accounting for the surprising surface of the rocks, polished by the oils of their fur. This is a walking excursion and involves uneven rocky terrain. Dry landing. Snorkelling at Punta Carrion. Bartolome Island After an invigorating breakfast we leave the hotel, cross Academy Bay by boat, and board our bus in Puerto Ayora. In order to shorten travel distance and save considerable time (Bartolome is the furthest island the hotel’s yacht visits), we will cross 42 km to the Itabaca Channel on the north shore, where the Sea Lion Yacht awaits us. This way, all that is left to sail is 21 Nautical miles (39 Km/24 miles) to Bartolome Island. Bartolome is famous for Pinnacle Rock, a towering spearheaded obelisk that rises from the ocean’s edge and is the best known landmark in the islands. Galapagos penguins — the only species of penguin found north of the equator — waddle precariously along narrow volcanic ledges at its base. Sea lions snooze on rocky platforms, ready to slide into the water to play with passing snorkelers. Just below the surface, shoals of tropical fish dodge in and out of the rocks past urchins, sea stars, and anemones. A perfectly- crescent-shaped, pink-and-white sandy beach lies just to the east of the pinnacle. Sea turtles use the beach as a nesting site and can sometimes be found wading in the shallow water near the shore, or resting in the sand to recover from the arduous task of digging nests, laying eggs and covering them over. We snorkel from this beach following a wet landing. Penguins dot the nearby rocks of the other landing site, less than a kilometer along the eastern shore. Here the submerged walls of a tiny volcanic crater give the impression of a fountain pool. A dry landing here leads to a 600-meter (2,000-foot) pathway complete with stairs and boardwalks leading to Bartolome’s summit. The route is not difficult and presents a museum of volcanology: a site left untouched after its last eruption, where cones stand in various stages of erosion and lava tubes form bobsled-like runs from the summit. 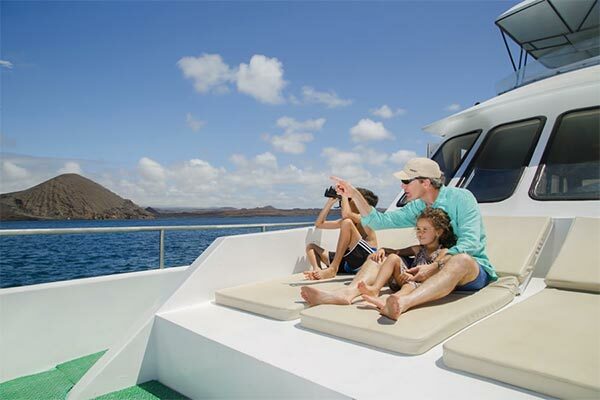 At the top you will be rewarded with spectacular views of Santiago Island and James Bay to the west, and far below, Pinnacle Rock and our beach, where the crystal blue waters of the bay cradle our yacht. We return to the Itabaca Channel, board our bus, and travel over the island back to the hotel. 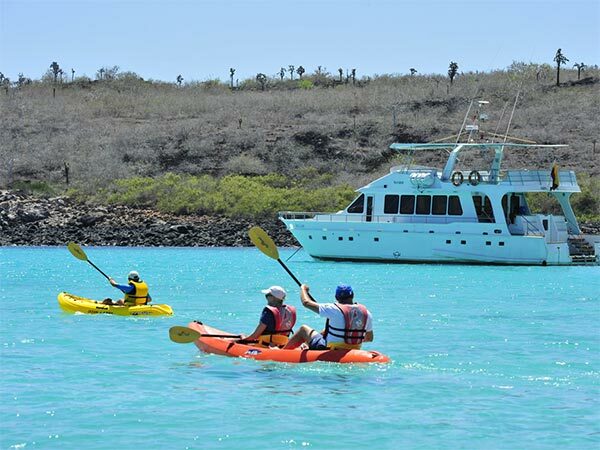 Tortuga Bay is a combination of ecosystems, landscapes, wildlife, sports and a lot of fun! We start after a (surely) much appreciated relaxed morning’s breakfast at the hotel, and a stroll along the neighbouring brackish lagoons. Our panga launch will take us to Puerto Ayora and a short distance further we reach the starting point of the trail to Tortuga Bay. The walking distance is 2 km (1.3 miles) along a fairly flat and straight path, where we explore and understand the arid, deciduous forest and its inhabitants. This is a great birding trail, if you take a little time to wander about and listen to the chirps and songs. You don’t have to worry too much about your day-pack, as you only need to carry the very immediate essentials: hat, sunscreen (to add more if rubbed-off), binoculars, camera and your water bottle. Over one kilometre of snow-white sand and turquoise waters with the never-ending sound of swells caressing the island. Some guests can opt for an unusual treat: surf instructors of the Santa Cruz Surf Club (CSSC) give surfing lessons here. Other activities include exploring the shore birds of Playa Brava, Tortuga Bay’s first beach, the nesting grounds of the green Sea Turtles, foraging marine iguanas, and the impressive change in sand, water, coastal vegetation and landscape, when you reach Playa Mansa. Protected by a natural lava barrier, this large, calm bay is surrounded by a gallery of mangroves. 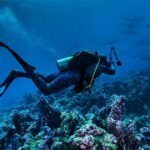 This habitat is the home of different species of marine and terrestrial birds, as well as young sharks and rays, which spend their youth in the protective, mildly brackish conditions. Kayaking in tandem sit-on top craft is a great way to experience nature up-close. Generally we end our Tortuga Bay experience with a soothing dip in the calm and clear waters of Playa Mansa, before we return to the hotel for lunch. After lunch, we will visit the Charles Darwin Research Station and the Fausto Llerena Giant Tortoise Breeding Centre, with time to enjoy the town. We then return to the hotel to enjoy the pool and/or the beach. DAY 8 l Galapagos to the Mainland / Home l B. After breakfast we leave the Finch Bay Hotel and on the way to Baltra Island airport, stop en route at the Twin Pit Craters (time permitting), a great geological depression of volcanic material, formed by a long process of slow sinking of the ground, where exceptional Scalesia trees, ferns, mosses, and orchids can be seen in the surroundings. Then, overland transfer to the airport in Baltra to take the flight back to the mainland to connect with your onward flight. ² Applies to ONE child for ages 6 to 11 – sharing a room with two adults / Child & Triples sharing existing bedding arrangements. 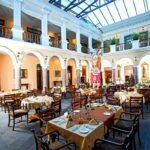 In Quito: Patio Andaluz Hotel is located in the heart of the historic “Quito Antiguo”, it was declared as a World Heritage Site by UNESCO in 1978.The hotel is an official National Treasure and holds centuries of history within its walls. It was part of the original Solaris (original building sites) that constituted the city of San Francisco de Quito by the time of its foundation. 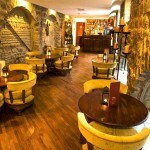 Patio Andaluz is surrounded by churches, museums and national monuments. This upscale, boutique hotel lies a 3-minute walk from Plaza de la Independencia, and a 5-minute walk from Parque La Carolina. 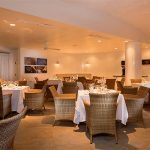 With a maximum capacity of 63 guests, the Patio Andaluz Hotel offers 11 suites and 21 standard rooms, a restaurant, a cava-bar, a library, and well-appointed amenities throughout the hotel without leaving aside the traditional value that is being offered in its typical colonial style. The elegant, colonial style rooms offer period furnishings, free Wi-Fi, flat-screen TVs with cable channels, and desks. They also come with seating areas and hardwood floors, and suites add a 2nd floor, and separate living room with a sofa. 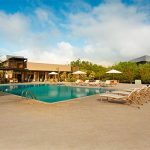 In Santa Cruz Island: Finch Bay Eco Hotel: A truly special location in what is undoubtedly, one of the most extraordinary places on Planet Earth. 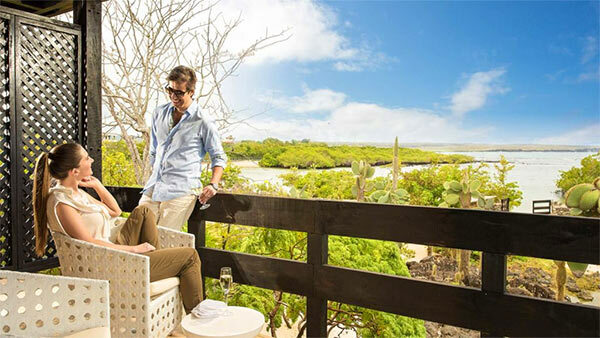 We built this hotel to offer guests a different and more personalized way of experiencing the Galápagos: combining excursions to the different islands, visiting the magical sites that Santa Cruz Island offers and enjoying the peaceful surroundings. An architecture in harmony with its surrounding nature; the use of modern technology to minimize negative impact on the ecosystem; and a group of people dedicated to serving our guests with warmth and professionalism, make the Finch Bay Eco Hotel a place you always want to come back to. Our efforts were recently recognised by winning “South America’s Leading Green Hotel” in the 2012 World Travel Awards and our great rankings on Trip Advisor – including a listing in the Top 25 Hotels in South America. For excursions, please take solar protection, cap or hat, bathing suit, long-sleeved shirt, water bottle, snorkelling gear (if you have your own; mask, snorkel and fins are provided free of charge), camera, appropriate shoes for wet landings and hikes on lava terrain (sneakers or similar) with thick soles. Expedition staff will give further details and recommendations, as well as more natural history background, the night before. Lunch is served on board the yacht during excursions. Please let us know of any dietary restrictions. The itinerary is subject to change due to weather conditions, safety, and local regulations. 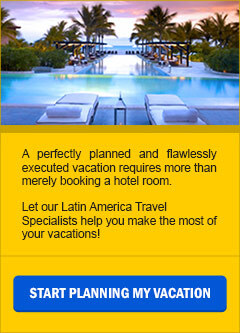 Deposit: A $900.00 per person deposit is required to activate the booking process. Due to the popularity of the destination and the high demand for space, early reservations are strongly encouraged. Additional deposits may be required by suppliers, if so you will be notified. Final Payment: The balance is due 90 days prior to the start of your tour. If full final payment has not been received by the due date, EcoAmerica Tours reserves the right to cancel the reservation without notice. The price does not include: personal expenses, additional activities, international and local airfares as well as airports departure taxes (unless otherwise indicated), gratuities to guides, drivers, porters, bell and wait staff, and any other service not listed. 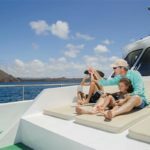 The Galapagos National Park Fee ($100.00 per person) and the Galapagos Immigration Card ($20.00 per person), as well as Fuel Surcharges (if any) are not included. Please refer to the attached terms and conditions as presented in the credit card authorization form and in our website: Terms of Travel. These terms apply in full to this travel program.